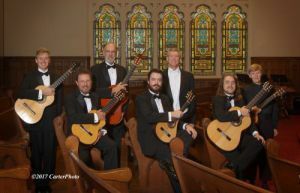 The Pensacola Guitar Orchestra – under the direction of Joe Stallings – will hold its 35th Anniversary Spring Recital on Saturday, April 14, at Pensacola State College. The performance is set for 7:30 p.m. in Ashmore Fine Arts Auditorium, Building 8, on the Pensacola campus, 1000 College Blvd. Admission is free. This year’s recital will feature the world premiere of an original composition written for, and dedicated to, the Pensacola Guitar Orchestra by Stallings ─ the founder and director of the guitar programs at Pensacola State and the University of West Florida. The piece, “Sea of Dreams,” was written to commemorate the 35th anniversary of the founding of the orchestra which held its first recital on April 15, 1983, at Pensacola State. The composition features instruments of the guitar orchestra, including the soprano guitar and the contrabass guitar. Pensacola State students Peg Barrett, Wayne Brouillette, Beau Buck, Jacob Graffrath, Patrick Kinnell and Brenan Woody will perform in the recital. The recital also will include works from various composers including Stallings, Johann Sebastian Bach, Leo Brouwer, Matteo Carcassi, Jürge Kindle, Julio Sagreras, Fernando Sor, Francisco Tárrega, Georg Philipp Telemann and William Walton. For more information, call the Pensacola State Department of Music and Theatre at 850-484-1847.